Dr. David E. Kirkland is the Executive Director of The NYU Metropolitan Center for Research on Equity and The Transformation of Schools. He has also been described as an activist and educator, cultural critic and author. 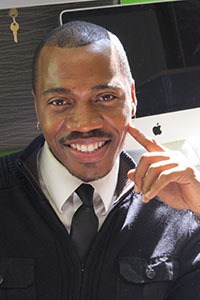 A leading national scholar and advocate for educational justice, Dr. Kirkland's transdisciplinary scholarship has explored a variety of equity related topics: school climate and discipline; school integration and choice; culture and education; vulnerable learners; and intersections among race, gender, and education. With many groundbreaking publications to his credit, he has analyzed the cultures, languages, and texts of urban youth, using quantitative, critical literary, ethnographic, and sociolinguistic research methods to answer complex questions at the center of equity and social justice in education. Dr. Kirkland taught middle and high school for several years in Michigan. He’s also organized youth empowerment and youth mentoring programs for over a decade in major U.S. cities such as Detroit, Chicago and New York. He currently leads efforts to enhance education options for vulnerable youth throughout New York City, and beyond. Dr. Kirkland has received many awards for his research and educational advocacy work, including the 2016 AERA Division G Mid-Career Scholars Award, the 2008 AERA Division G Outstanding Dissertation Award. He was a 2009-10 Ford Foundation Postdoctoral Fellow, a 2011-12 NAEd/Spencer Foundation Postdoctoral Fellow, and is a former fellow of the National Council of Teachers of English (NCTE) Research Foundation's “Cultivating New Voices among Scholars of Color” program. In addition to several other boards, he currently serves as a trustee for the Research Foundation of the National Council of Teachers of English. A Search Past Silence: The Literacy of Black Males, the fifth book that Dr. Kirkland has authored, is a TC Press bestseller and winner of the 2015 Daniel E. Griffiths Research Award, the 2014 AESA Critics Choice Award, and the 2014 NCTE David H. Russell Award for Distinguished Research in the Teaching of English. He is also co-editor of the newly released Students Right to Their Own Language, a critical sourcebook published by Bedford/St. Martins Press. Named by Ebony magazine as one of the most brilliant scholars in the U.S., Dr. Kirkland has been a pivotal intellectual voice promoting educational justice in the U.S. and abroad. "How a Dyslexic Boy Fell in Love with Words"
"Transformation Needed to Integrate School"
"English Professor Directs NYU Center to Make Education More Equitable"